All men dream, but not equally. Those who dream by night, in the dusty recesses of their minds, wake in the day to find that it was vanity, but the dreamers of the day are dangerous men, for they may act their dream with open eyes to make it possible. T. E. Lawrence, "The Seven Pillars of Wisdom"
Arctic Kite Tour 2009 - It's in the bag! On 27 July 2009 our dream of skiing from Narsaq, in the southern part of Greenland, to Qaanaaq in the north-western part of Greenland came true. We tried in 2007 but had to abort due to appalling weather conditions. However, we had promised each other to return to Greenland as soon as possible and finish the job. And so we did. What a glorious feeling it was to be able shake hands and celebrate our success. 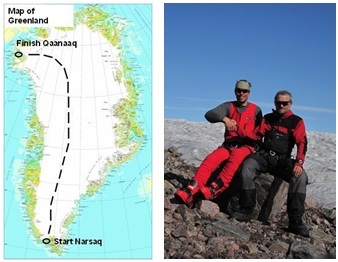 You can read about the expedition under the heading "Arctic Kite Tour 2009" in the contents menu frame.